A few weeks ago, an event took place over the airwaves. It was the premiere of Project Runway, the only reality show I actually follow. Every time I watch it, I'm amazed at what these people produce in a day. I don't think I could ever do that. I also didn't go to FIT (Fashion Institute of Technology, and yes, that's a real place) and take several years of sewing and costuming and sketching, etc. And that's why I'm currently not on the show. This season, the show is based out of Los Angeles instead of its normal home of New York City. Personally, I'm not a huge fan. I'm an East Coast gal all the way, and I like my subtly muted color palettes and ability to mix seasonal items. They don't have seasons that they can mix in Los Angeles, and so essentially I spend the whole show wondering when Tim Gunn is going to get so hot that he simply can't wear his trademark suit. Truthfully, it doesn't blend with the whole surfari theme, bro. 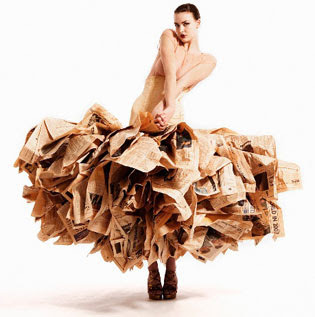 This dress is made of newspaper. I knew recycling was a good idea. If you have a strong opinion about this season of Project Runway, let us know here at the Longwood Look!